I've today upgraded the RSS and Atom news aggregator of Midgard CMS, net.nemein.rss to utilize the latest Magpie RSS release. The main new feature in Magpie 0.71 is support for multiple character encodings. დიდი მაგლობა (big thanks) to Steve Minutillo and the Magpie RSS team for fixing this issue! 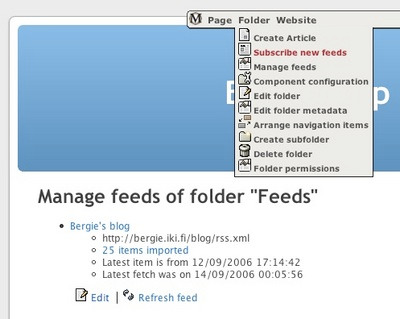 Updated 2004-12-23: Another new feature in net.nemein.rss is that now it should tell MidCOM's caching to expire the aggregator pages every half hour, just like the Magpie RSS cache has been set to do. This means that the subscribed RSS feeds will be checked for relevancy once every 30 minutes also if MidCOM's cache system is enabled on the site. While this uses some bandwidth, Magpie RSS utilizes Conditional GET in its queries. If the feeds support the 304 headers they will be downloaded only if they have actually been changed. See the Regular Sucking Schedule blog for more information. Contrary to earlier reports, the RSS feeds generated out of MidCOM components like de.linkm.newsticker do not yet support Conditional GET. Bug #143 has been filed on this. 28 October 2004. 2 minute read. 13 September 2006. 1 minute read. Midgard CMS has had an integrated RSS and Atom aggregator for several years. It has been used for both bringing simple news feeds to portal sites, and for Planet-like large-scale blog aggregation.